Fifteen students received undergraduate research awards from the Woodruff Library and the Rose Library at a brunch earlier this month. Pictured from left: University Librarian Yolanda Cooper, Andrea Abbate, Emory English professor emeritus Ronald Schuchard, Samantha Perlman, Mary Cate Sullivan, Sierra Cortner, Jessica Bertram, Cloe Gentile, Jeff Haylon, Míša Stekl, Nina Burris, Rose Library director Rosemary Magee, Gabe Morbeck, and Andrew Sullins. Photo by Emory Libraries. The Robert W. Woodruff Library and Stuart A. 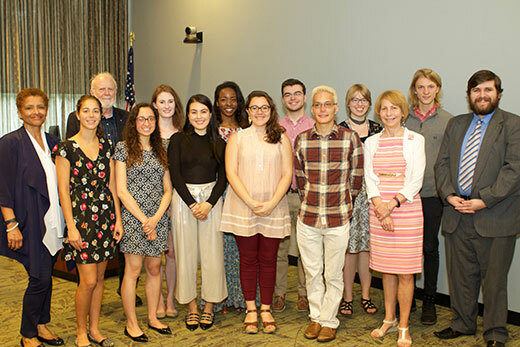 Rose Manuscript, Archives and Rare Book Library at Emory University recognized 15 students with undergraduate research awards for their projects and papers that used primary sources they found in the libraries. The Elizabeth Long Atwood Undergraduate Research Award, given by the Woodruff Library, recognizes Emory College undergraduate students in all disciplines who use the Woodruff Library’s collections and research resources in their original papers, digital projects, or posters; and show evidence of critical analysis in their research skills (for example, locating, selecting, evaluating and synthesizing information). The Bradley Currey Jr. Seminar Award is open to undergraduates in all years of the honors program of the Emory College of Arts and Sciences, or any upper level student who is conducting original research. Successful applicants attend two intensive instructional workshops that train them to locate archival repositories, assess manuscript and special collections, plan their research, and properly handle rare materials. Students who complete the training receive grants intended to help defray the costs of conducting original research in an archival repository. Chris Batterman, class of 2019, music and psychology major. “Il Guarany: Indianism and Brazilian National Identity in the Music of Antônio Carlos Gomes. Jenifer Norwalk, class of 2018, art history major. “Frederic Leighton’s 'The Reconciliation’." The Alan Rackoff Prize was established through the Betsy and Wayne Rackoff Fund and named in honor of Dr. Rackoff's late brother, an Emory student in the class of 1973. Dr. Wayne Rackoff 75C, vice president of clinical oncology at Janssen Research & Development (a Johnson & Johnson company), was among the first generation of Emory students in English courses to have access to primary materials in what was then known as Special Collections (now the Rose Library). The experience made a lasting imprint on his intellectual life and led him to become a longtime supporter of the archival collections. The prize awards $1,000 to one student each academic year for the best research paper, project, or honors thesis based on primary source material related to a class or course of study in any academic department except the Department of English. The Schuchard Prize was established through the Betsy and Wayne Rackoff Fund and named in honor of Wayne Rackoff's archival mentor, Ronald Schuchard, Goodrich C. White Professor Emeritus of English. The prize awards $1,000 to one student each academic year for the best research paper, project or honors thesis based on primary source material related to a class or course of study in the Department of English only. Sierra Cortner, class of 2017, English/international studies. Winner, “The Power of Design: Indoctrination of Class and Domestic Ideals in William Morris’s Kelmscott Chaucer.